Home/Frequently Asked Questions About Educational Leadership/What Degree Do I Need to Work for the U.S. Department of Education? Depending on the specific job position, the U.S. Department of Education (DOE) sometimes hires candidates with bachelor’s degrees, but most pedagogical related positions require a master’s degree. All federal jobs are exclusively posted through the federal government’s USAJOBS website. 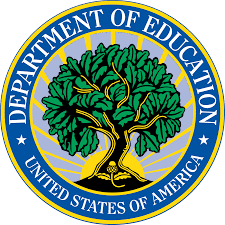 The Department of Education uses an e-recruit system that is called the ED Online Opportunities Recruitment System (EdHIRES), which is fully integrated with the USAJOBS system. Students who wish to apply for jobs at the DOE must create a USAJOBS account to apply for vacant positions. The information provided during the USAJOBS application process is automatically sent to EdHIRES. What Degrees are in Highest Demand? Any DOE job directly related to the educational process will require a master’s degree. A Master of Arts in Teaching (MAT) is best for students who plan on becoming licensed teachers, but a Master’s in Education (M.Ed.) is designed for educational leaders and administrators. There are many specializations within M.Ed. degrees, such as adult, special, higher and early childhood education. Curriculum development and educational leadership are also popular choices. Students may also pursue a master’s degree in business, management or public administration. Depending on the career goals of the student, an MBA with a specialization in Human Resources or Information Technology may be a good choice. Writers who work for the DOE will be expected to have a bachelor’s degree. These employees will be responsible for researching current procedures on assigned subject matters to gain further knowledge for internal and external publications. A writer who works for the Federal Student Aid (FSA) office will compose and publish internal procedures for employees and external procedures for students and learning organizations. Some writers are tasked with updating FAFSA website content, such as FAQs and guidelines. Experienced writers who are tasked with officially responding to external inquiries from colleges, the media and financial aid administrators will need a master’s degree. A program outreach coordinator will need a bachelor’s degree in business, communications or project management. They are responsible to develop and maintain harmonious relationships with private and public colleges and learning institutions. Program outreach coordinators are often assigned to specific departments that deal with accreditation, federal funding or curriculum standards. They are sometimes called to travel and visit new or existing schools in order to provide training and outreach programs. Senior program outreach coordinators who facilitate the development of technological solutions for federal employee training programs will need a master’s degree. A supervisor will work under the direction of a manager or director who is in charge of things like policy analysis, curriculum development or higher education outreach. They work to ensure the competency and professionalism of assigned staff within specific units and departments. They manage daily operations, provide hands-on supervision, evaluate work quality and provide assignment feedback. They manage staff hiring, scheduling and disciplining. They collaborate with other educational specialists and administrators to coordinate the dissemination of updated procedures and guidelines. DOE supervisors must have a master’s degree in an appropriate field. Some entry-level U.S. Department of Education jobs require a bachelor’s degree, but most jobs directly related to the pedagogical process will require a master’s degree. For more information on obtaining on master’s degree in education, please see: Top 15 Best and Most Affordable Graduate Educational Leadership Programs.